Society of Military Widows- The Society of Military Widows (SMW) was founded in 1968 by Theresa (Tess) Alexander to serve the interests of women whose husbands died while on active military duty, of a service-connected illness, or during disability or regular retirement from the armed forces. SMW is a nonprofit organization chartered in the State of California under section 504 (c) (4) of the Internal Revenue Service Code. Surviving Spouses Support Group-The Surviving Spouse Support Group has one goal. It fills in the gap where military life ends, and a new normal begins. A military widow/widower means being misunderstood by friends and family; we are often left behind and forgotten. SSSG seeks to promote healing and strength by reaching out to widows/widowers of spouses who died serving our Nation. (non profit status not available on website). Disclaimer: The above web sites are not associated with, endorsed by, or sponsored by the Gold Star Wives of America, Inc., or its Board of Directors, and has no official or unofficial affiliation with the Gold Star Wives of America, Inc., or its Board of Directors, or its membership. 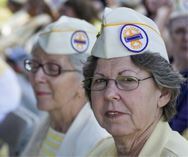 This web page was created as a resource for the members of Gold Star Wives of America, Inc.